A must have accessory for all liquids! 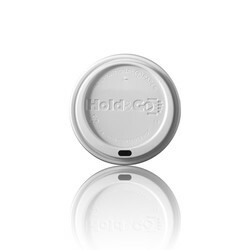 Keep refreshments from being jostled and spilled by pairing our Insulated Paper Cups with these Dome Lids. Features a dome design and spout for convenient sipping. Fits 12, 16, and 20 oz. Insulated Paper Cups. Perfect to have on hand at coffee shops, restaurants, and concession stands. This product is sold in increments of 100 only. Made in the USA. Sold in increments of 100 only. Price is per piece. Blank only.